Artist's illustration of the alien planet Kepler-186f, which orbits in the habitable zone of a red dwarf star. Astronomers are narrowing the field in their search for a "second Earth." An international team of researchers has identified the 20 most Earth-like worlds among the more than 4,000 exoplanet candidates that NASA's Kepler space telescope has detected to date, scientists report in a new study. 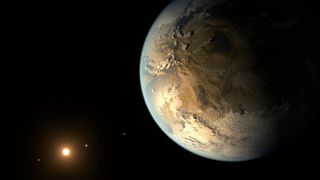 Identifying these Earth-like planets is important in the hunt for alien life, said study lead author Stephen Kane, an associate professor of physics and astronomy at San Francisco State University (SFSU). "[It] means we can focus in on the planets in this paper and perform follow-up studies to learn more about them, including if they are indeed habitable," Kane said in a statement. Second-Earth candidates had to be safely within the habitable zone. If a planet is too close to the inner edge, it could experience a runaway greenhouse effect like the one that occurred on Venus. And if it's too close to the outer edge, the planet could end up being a frigid world like Mars, the researchers said. In addition to categorizing the planets by their place in the habitable zone, Kane and his team also sorted them by size, ruling out worlds that were big enough to be gaseous. There are five confirmed planets in the top 20: Kepler-186f, Kepler-62f, Kepler-283c, Kepler-296f and Kepler-442b. The other 15 are unconfirmed candidates. Categorizations like this suggest that the universe is teeming with planets that could possibly harbor life, study team members said. "It's exciting to see the sheer amount of planets that are out there," study co-author Michelle Hill, an Australian undergraduate studying abroad at SFSU, said in the same statement. "[It] makes you think that there is zero chance of there not being another place where life could be found."